Google’s social networking website ‘Orkut’ is now available on Android powered mobile phones with launch of Orkut for Android application. Now you can connect with Orkut friends on the go through scrap notifications, direct photo uploads to orkut albums and a phonebook synced to your orkut friend’s phone numbers. 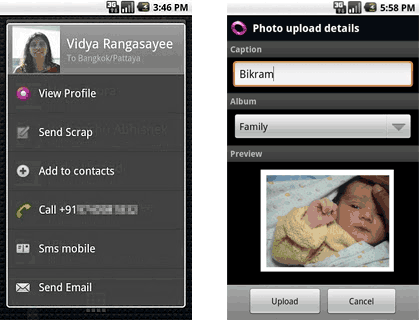 To get Orkut for Android application on your mobile phone, goto Android Market from your Android powered phone device. Search for Orkut under social application category. Alternatively, you can directly scan the QR code available here to install this application. (for Android devices running version 1.6 or higher). After installing the application, you can goto “Menu > Add > Folders > Orkut” to install a live folder. Then add list of your orkut friends as a live folder on your home screen. Once setup, live folder allows you to communicate via call, scrap or SMS with your Orkut friends in a single click. Grab this Orkut app for Android device to stay connected with Orkut friends while on the move.